This last weekend we had a family party for Easter. I love getting together each Easter to celebrate the resurrection of Jesus and also to visit with family we don’t see often. 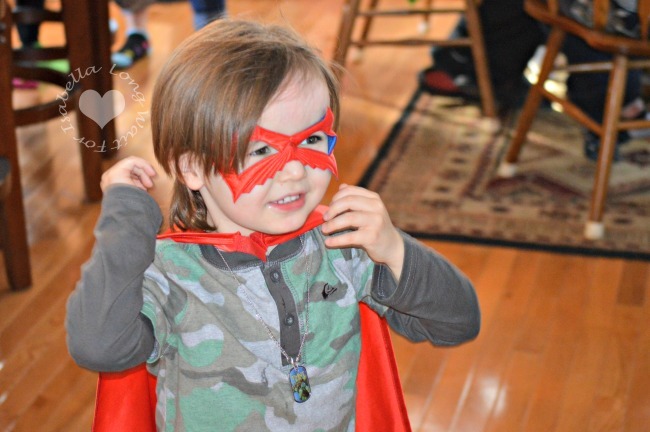 My Little Man wanted to wear his new superhero costume that day which was fine by me. 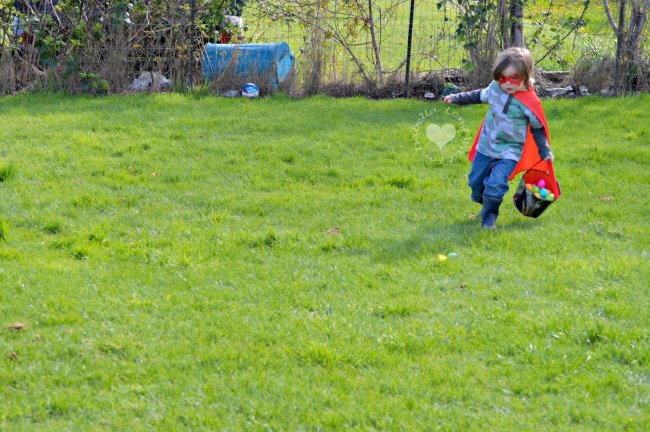 He was a super Easter egg hunter indeed! 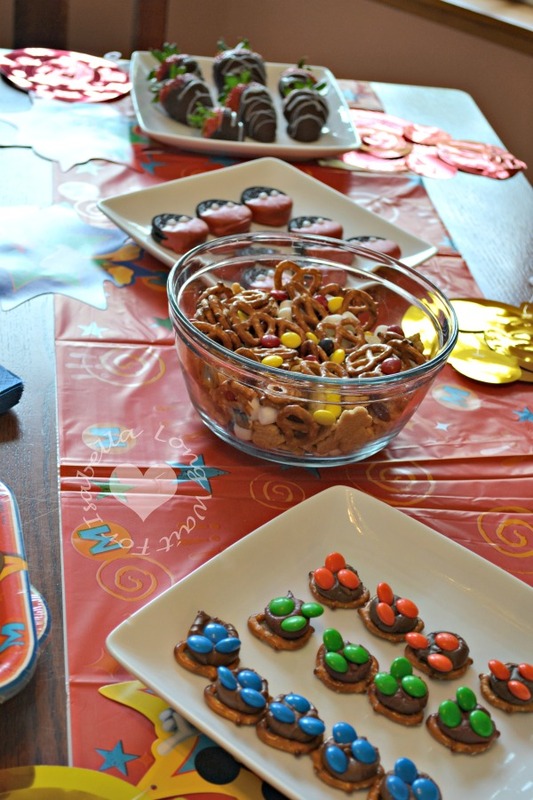 The entire family, young and old, loved the Mickey Mouse preschool party idea. Who doesn’t love Mickey? 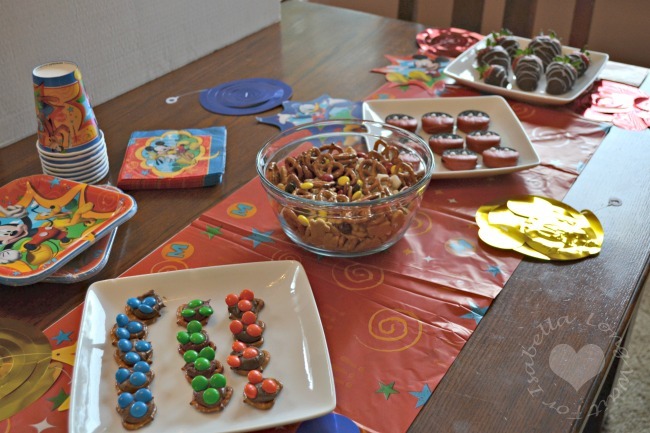 My preschooler loves Mickey Mouse and Disney Jr. and since Disney sent some great party supplies, I thought I’d make fun Mickey Mouse inspired snacks for our Easter party. 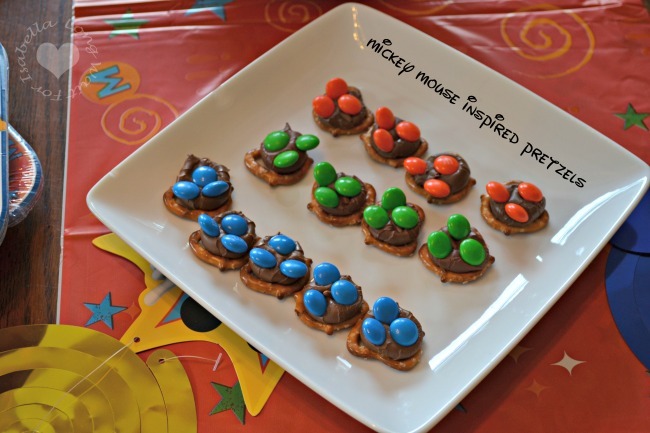 I scoured Pinterest for ideas and wanted to publicly thank The Delightful Life for her idea of Mickey Mouse Pretzel Treats. As well as Trips with Tykes for her idea of Mickey Mouse Trail Mix. 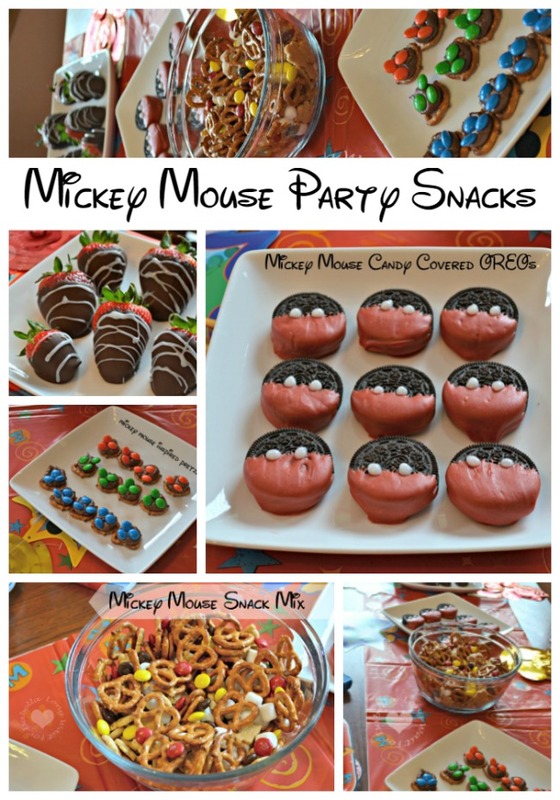 I included those ideas in my own Mickey Mouse treat round-up for Easter. I could have only used red M & Ms for the top of my pretzel candies, but I decided that with the color scheme of decor that Disney sent, I could use any of the M & M colors. 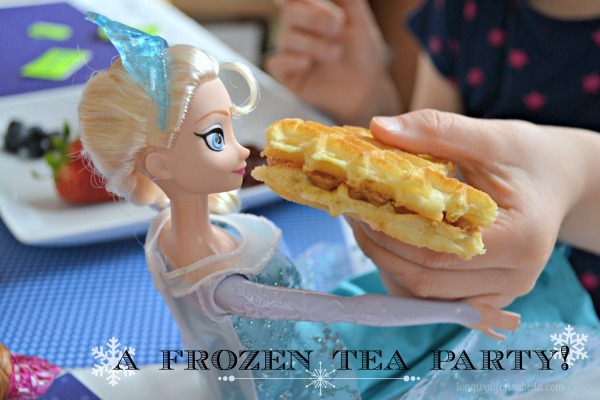 I did not have the exact same ingredients as the Trips with Tykes blog so I kind of just winged it with what I had. Since it was Easter, I used Annie’s Bunnies Snacks. We like those in our house and already had a box. Since I had those pretzels and M & M’s from the other snack, I used those. I actually picked out the red, yellow and brown M & M’s for this snack mix. You could also use raisins; my kids do not like raisins. Mini marshmallows happened to be the hit of this snack mix. Both my kids were picking those out and loving them. 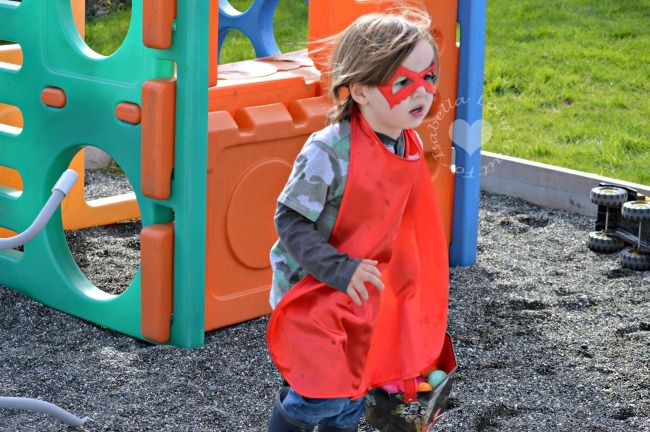 To try the Annie’s snacks my kids love, buy Annie’s Bunnies Snacks here. 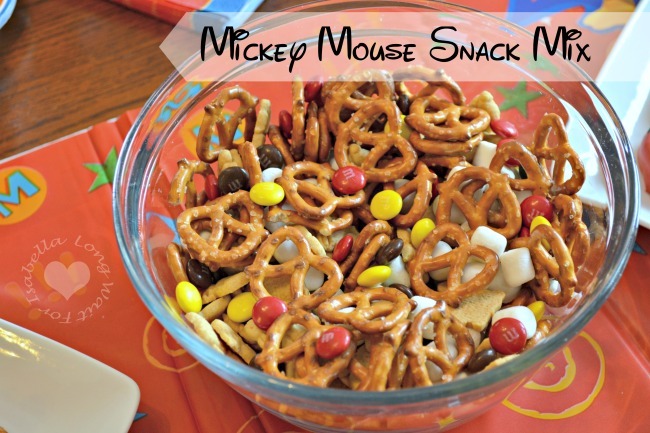 This was my husband’s favorite Mickey Mouse party snack. After Christmas, I bought a couple bags of red candy melts on clearance. I knew I’d use them for something. 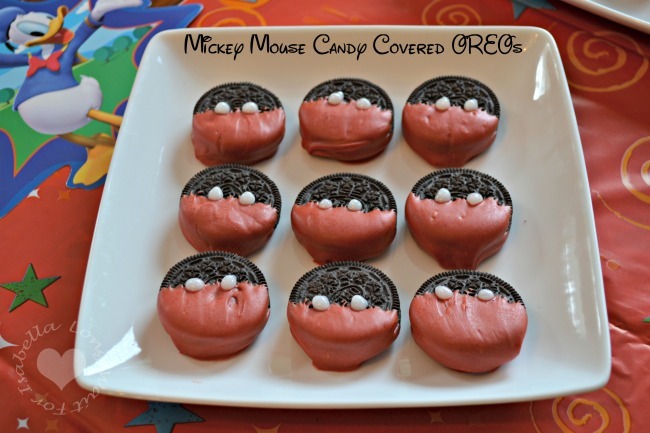 This was the perfect Mickey Mouse food idea. These little cookies look like Mickey Mouse’s pants. The only white that I had in my pantry was a shimmering white decorating gel and it worked great. I love how easy the Wilton Candy Melts melt in the microwave and how easy it is to dip and harden. I definitely recommend that you buy Wilton Candy Melts. 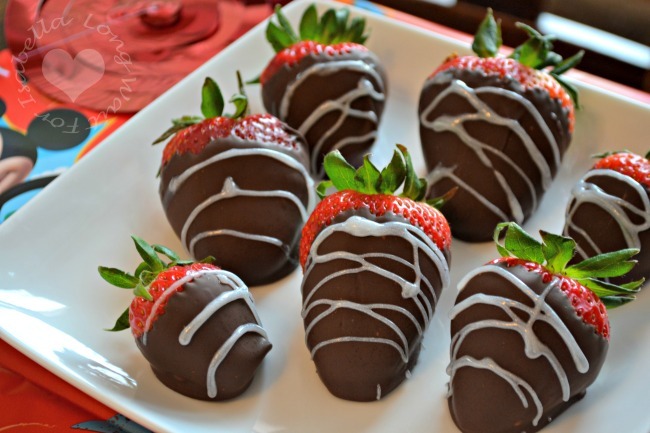 I thought chocolate covered strawberries would be great and match the color theme of a Mickey Mouse party. Plus, they just taste so good don’t they? I use the Baker’s Dipping Chocolate because it can be microwaved in the cup and then the cup is thrown away. I don’t have to wash any dishes! You can buy dipping chocolate here. We had such a fun party. Our Easter was great. 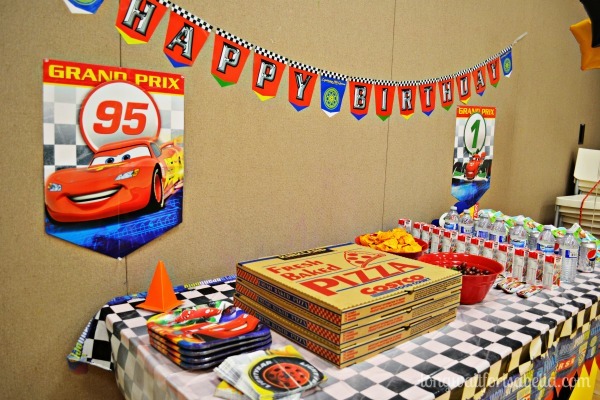 I’d like to thank Disney for sending party supplies and inspiring this preschool fun. They sent games including Disney BINGO and Disney Charades — we didn’t get a chance to play them, yet. For a great game that we own and love buy Disney Headbandz from Spin Master Games — it’ll provide so much family fun. All the kids love this one. 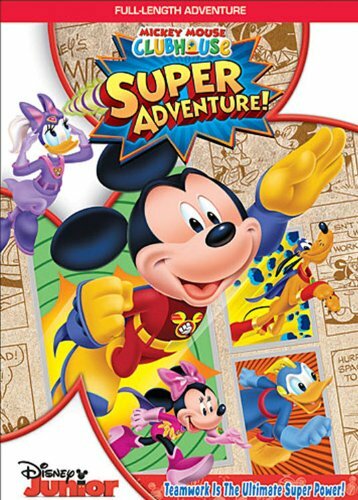 Do you have a Mickey Mouse fan in the house? Disclosure: I was sent party supplies for this Disney Preschool Party. No other compensation was given. All opinions and my love for Disney is all my own.